With a renewed spirit for teaching and an extended Premium character, the products of SYSTEMPOOL for the 23rd International Exhibition maintain the spirit of presenting our material KRION®, as a centrepiece born from nature, elevating it to the greatest design, incorporating the functionality and practicality of daily life. Our material comes from the ground, stone, and bauxite which provide us with most of our product’s properties thanks to its transformation in alumina hydrates. We follow our tour through the nerve centre of KRION®, and see its formats, colours, properties, and laboratory tests, which, above all, highlight the benefits of KRION® compared with other materials. All of this will be available to our visitors in KRION® LAB (New Generation Solid Surface). Once the “From where? How? and Why?”, have been addressed, we are struck by the glamour which our visitors will see. In this new exhibition we present sectors and applications in a Premium format. To do so, the K® Fusion (Bespoke Solution) concept, and the combination of KRION® sheets and elements are presented to show the best possible solutions in the applications chosen for our Showroom: Home, Hotel, Clinic, Retail, and Restauration. As for new products, we present 25 colours and a new collection made up of 7 colours, the ASTEROID Series, with which KRION®, the Solid Surface from PORCELANOSA Group, takes a step further and creates a new generation of Solid Surface, with innovative technical and functional characteristics, in this case in the field of design and aesthetic perfection. 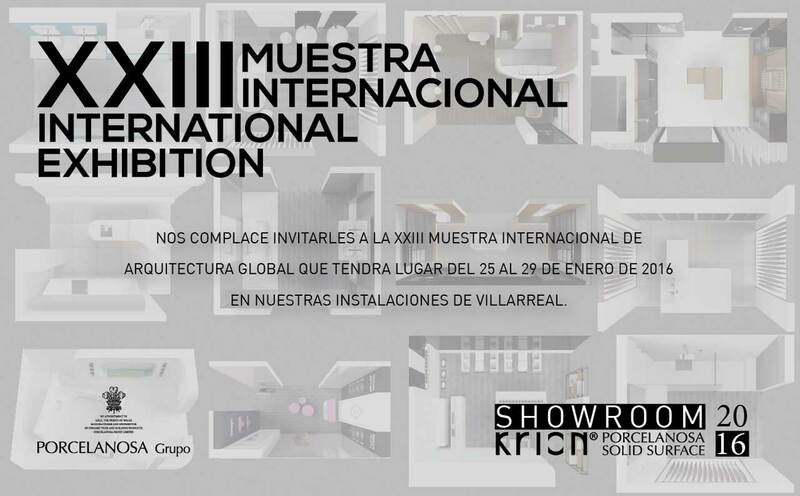 Finally, in this exhibition we present K® BIM and K® QUALITY FABRICATOR. With K® BIM (New Technologies for Architects), KRION® offers architects and interior designers technical support and our products in BIM format (Revit and Archicad) through our bookshop available on our website. A new era has arrived for design and architecture. At KRION®, we continue to seek the best for our clients, and with this aim in mind the K® QUALITY FABRICATOR programme was created, associated with and committed to quality standards, highlighting the huge importance of proper transformation, following the guidelines established by SYSTEMPOOL. During this exhibition, the K® QUALITY FABRICATOR programme will come to life, being the culmination of an ambitious project which is another step towards excellence.